The INCREASING PRODUCTIVITY AND PROFITABILITY OF SMALL AND MARGINAL FARMERS IN RICE-BASED CROPPING SYSTEMS(APART) project in Assam has the objectives to strengthen postharvest management by introducing improved practices, including postharvest mechanization and supporting a service economy to reduce losses, increase efficiency and profitability, and improve the rice value chain. It also aims at developing knowledge materials, fostering strategic partnership and capacity development of the various stakeholders (public, private, and development partners) of extension functionaries in Assam. Assam Agricultural University (AAU) and the Department of Agriculture (ATMA) are the implementing agencies, but there are many other public and private stakeholders that are important and have roles in upgrading the rice value chain. For embracing these stakeholders IRRI is faciltiating a Learning Alliance (LA) for “Improving mechanization in post-harvest to reduce losses and improve quality of rice”in Assam. The LA was initiated during the Participatory Impact Pathway Analysis (PIPA) Workshop condducted on November 16-17, 2018at Assam Agricultural University in Jorhat. It currently consists of representatives from relevant government institutions, farmers, machinery manufacturers and distributors, and representatives of NGOs. 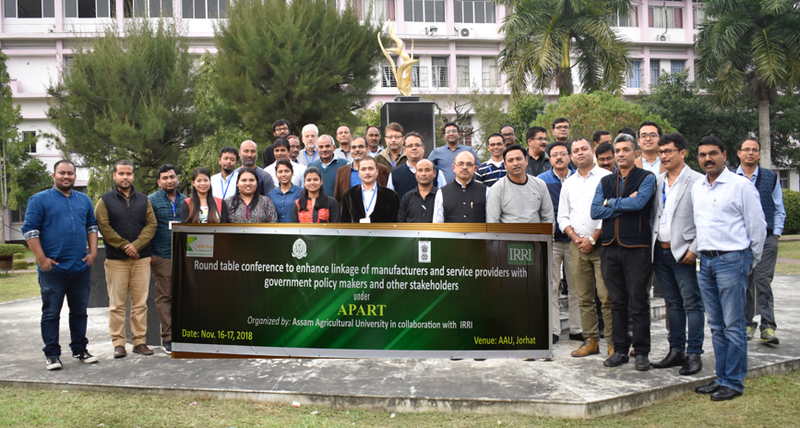 The initial Learning Alliance members: Participants of the Participatory Impact Pathway Analysis Workshop, November 16-17, 2018 at Assam Agricultural University.